its own privat parking and entrance to the road. 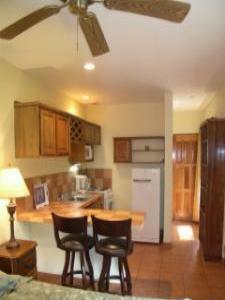 There is fully equipped kitchen with all amenities. microwave and a coffeemaker and toaster. The studio has also an alarmsystem. Daily maid and laundry service is included in the price. The volcano Poas is 35 minutes away. The town of Grecia with restaurants and shops is less than 1 mile. Jaco beach is 1 hour and 20 minutes. timeshare for $8500.00 for 1 month a year for liftime .